How to get there: The natural starting point is Grotli. Grotli is located near the upper part of the Otta valley. Access from the west is from Stryn, from the east, drive E-6 to Otta, then E-15 towards Stryn. You should pass the village of Lom and continue 60 more kilometer. At Grotli, make a left onto the old road, it continues a short stretch and ends (in winter) in a big parking lot that serves the local vacation huts. This location is N62:00.378, E007:37.807, elevation 907 meter. Start out along the road (the old road to Stryn, open in the summer), this road serves the local cabins in the winter. Soon, you will arrive at a signed fork, where the trail to Skridulaupbu forks left. Follow this track across the creek and up on the hillside on the far side. Continue skiing uphill, the local horizon is a minor bump, one may ski across or contour around on the (left) side. Cross lake 1257 and continue uphill in order to reach the north side of the small glacier that lies on the east side of the 1949 (East) summit. As soon as you access the glacier on the east side, ski this along a path that gradually turns right. 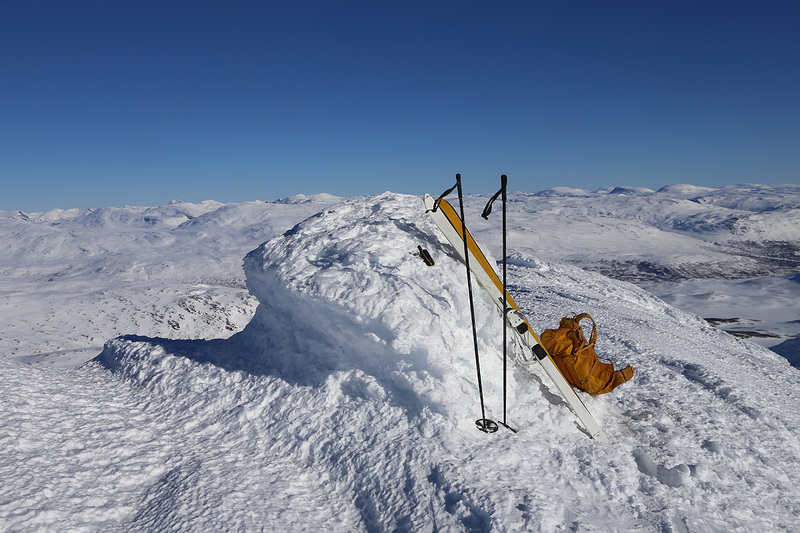 This will get you to the very large cairn on the summit of Skridulaupen East summit. From here, descend along the ridge to the main saddle that separates the East peak from the main Skridulaupen peak. This hillside may have limited snow and (perhaps) many boulders. 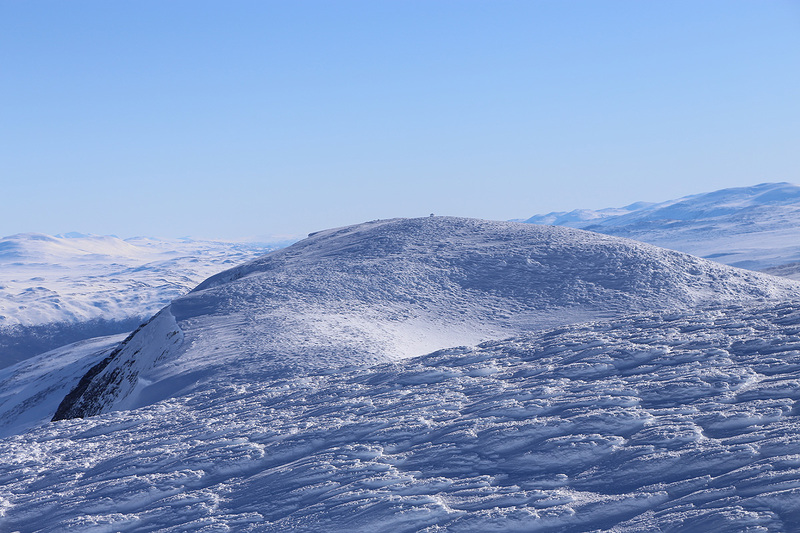 From the saddle, ski up the hill, traverse slightly left of the local summit and access the highest point. 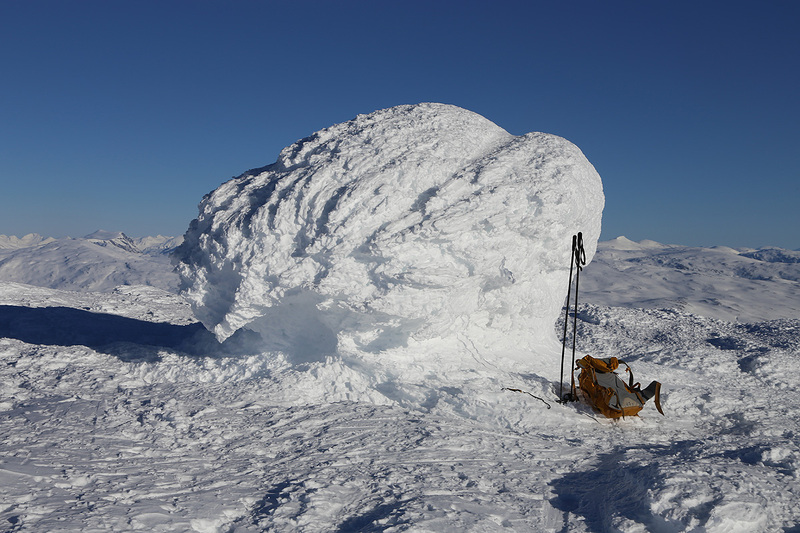 This summit has two bumps, the cairn is located on bump number two. 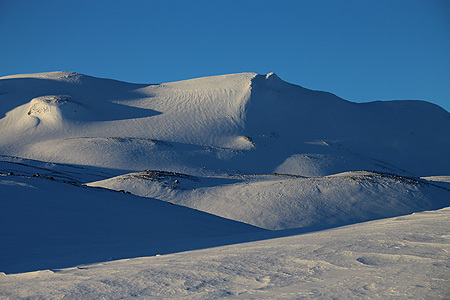 With good snow conditions, one may ski directly down from the first saddle towards the north, then descend along a line that brings you back to the route of ascent. Alternatively, return to the main col between the two summits, then contour across the shallow pass between the east summit and point 1872 (south-east), then return back down to the line of ascent. First attempt: I had a nice stay and a good dinner at the well known Fossheim hotel in Lom. Driving up to Grotli, I arrived at 0845 and was ready to leave by 0900. The weather was more cloudy, but no wind. Blue patches of sky as well. I had learned my lessons from the two previous days, avoid (at almost any cost) to break trail below the birch tree line. Thus, I followed the groomed track that ran on top of the (summer) highway across to Stryn. Not a single ski track outside of the groomed highway. I skied a long ascending traverse and up to lake Åfåttjørnin, 1273 meter. I continued more or less directly towards the lower end of the glacier on the east side of Skridulaupen. Unfortunately, the weather did deteriorate rather consistently. It started to snow and the wind increased steadily. The summit of Skridulaupen completely disappeared into dense clouds above me. There were still stretches of deep snow and breaking the trail was not without effort. I took a break just as I crossed above 1600 meter. I had already seen the sloping glacier, it was clearly a nice and very good route, not as steep as causing any concerns for avalanche. Still, a decision should be taken here. I was fairly confident that I could navigate safely up and along the summit ridge to the highest point. It had taken me 3 hours to get this far, the trip would be long. The wind would push me around higher up and there would be zero visibility. I looked up towards Skridulaupen, hidden in a dense cloud. She told me that she preferred no visits today. I accepted the hint and told her that I would be back at a later time when I would be more welcome. Thus, I turned around and started skiing back down. My route had been almost entirely uphill, with a good track I could now ski rather easily back down. It took me one hour to return to the trailhead. The weather was now changing all over western Norway, it seemed clear that I should return to Bergen and declare this skiing trip to be over. I arrived back home by 1900, enjoying a good evening meal with my wife Heidi. Second attempt: A very nice day indeed, I climbed Tordsnose the day before. I slept in my car at the large parking area and wanted to start early, a Sunday dinner back home in Bergen is always tempting. However, this required me to be back down by around 1400 at the latest. Thus, I started early. I was skiing by 0620. The day was clear and crisp, -16C at the start. The skiing was nice and I arrived at the East summit by 0930. A good rest was called for, before I continued along the ridge and subsequently ran into non-skiing terrain in the final hill descending to the col. From here, skiing was again quite ok and I made the final, and highest, summit at 1030. Another break, then I skied back down to the main col, followed by a traverse that brought me nicely to the col between point 1872 and the East summit. From here, the route is mostly downhill. I was back at my car at 1235, slightly less than 2 hours from the highest summit. I left Grotli shortly before 1300 and had a nice and sunny drive back to Bergen. It is good to see that the main coastal highway (E-39) finally is getting upgraded to "a real road". Also noteworthy, the ferry across Sognefjorden now runs at 20 minute intervals and at least one boat is purely electric (runs on battery power), very nice indeed. Skridulaupen, as seen from Grotli hotel. View back to the East summit.